Hex Hall [Book Review] – my books. my life. When Sophie Mercer, a witch, accidentally destroys her high school’s prom, she is is sent to Hecate Hall, affectionately known as Hex Hall. 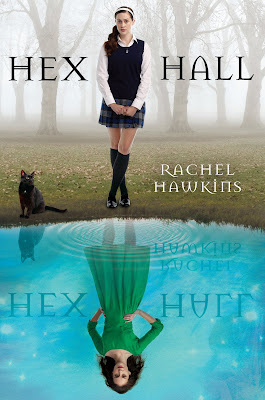 Hex Hall is a type of reform school for wayward young witches, shapeshifters, faeries. The school also houses Jenna, Sophie’s pink-loving vampire roommate. When the popular girls start getting hurt in what appear to be vampire attacks, all the signs point to Jenna. But Sophie’s out to discover what’s really going on at Hex Hall. I don’t think I’ll ever get sick of teenage paranormal stories. There’s something about adding magic or vampires to the already drama-filled lives of teenagers that I find absolutely fascinating. And Hex Hall did not disappoint me. It was a quick read and a fantastic start to a new series. Hawkins gives Sophie a wonderfully snarky teenage voice that I found realistically entertaining. If you, like me, can’t get enough of these types of books, Hex Hall should definitely make your reading list. I’m totally going to have to read this one! Thanks – I was totally out of books I felt like reading. I enjoyed this book a good deal. I thought it had a great combination of characters and plot that would appeal across a wide range of readers. Glad you enjoyed it as well.